What is an EIS exemption? What is the EIS exemption process? What information is required to lodge an EIS exemption application? An Environmental Impact Statement (EIS) is required for any development application (DA) in the impact track under section 123 of the Planning and Development Act 2007, unless an EIS Exemption is granted. A proponent may apply for an EIS exemption for any proposal that would trigger an EIS. Under section 211 of the Planning and Development Act 2007, the Minister has discretion to grant an exemption if satisfied that recent studies have adequately addressed the expected environmental impacts of the proposal, whether or not the recent studies relate to the particular development proposal. In deciding whether to grant an EIS exemption, the Minister must consider any submissions received during the consultation period for the EIS exemption application. The Minister may grant a conditional EIS exemption. 5 years after the day the exemption is notified. The applicant submits a draft EIS exemption application to the planning and land authority (the Authority). Once it is accepted for lodgement, the draft EIS exemption application undergoes a public consultation period for a minimum of 15 working days. Any public submissions which are received are published on the Authority’s website and provided to the proponent to consider in revising the application. Entities are also consulted during this time. The applicant has the opportunity to address matters raised during public consultation in preparing a revised EIS exemption application. The Authority assesses the revised application and prepares an EIS exemption assessment report for the Minister. Grant the proposal an exemption from requiring an EIS if they are satisfied that recent studies sufficiently address the expected environmental impact of the proposal. This means that the applicant can lodge a development application in the impact track for this proposal. The EIS exemption is required to be submitted as part of any subsequent DA for assessment. 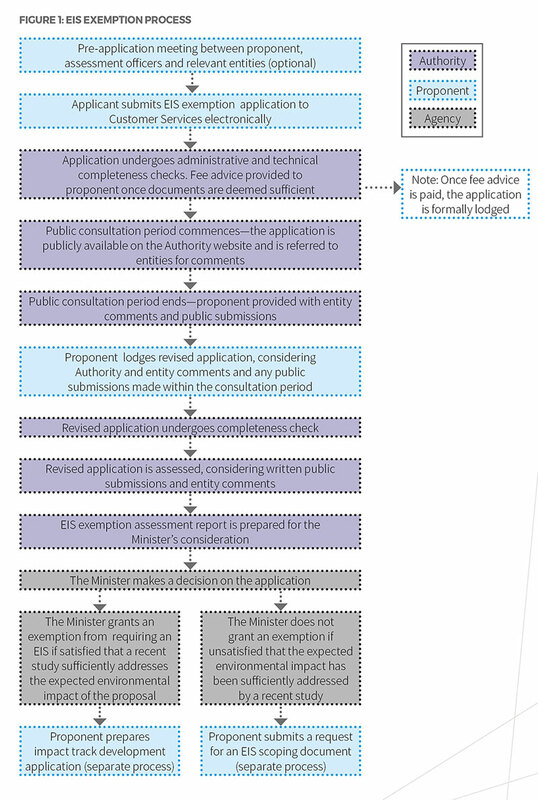 If an EIS exemption is granted, the EIS exemption assessment report will be made available on the Authority’s website. Not grant an exemption if unsatisfied that the expected environmental impact has been sufficiently addressed by a recent study. The applicant may then submit a request for an EIS scoping document to commence the EIS process. An EIS exemption application must provide sufficient information about the proposal to understand the potential impacts of the proposal. A detailed guide on requirements for lodgement is provided in the guidance document for proponents. information on any decision made under the Environment Protection and Biodiversity Conservation Act 1999 in relation to the proposal.